UPDATE — November 10, 2010 — The good news is Moss reopened today after resolving a reported tax bill of around $150,000. It seems that for now the store is safe. The bad news is your credit card may not be. “Design Hates a Depression“—that was the verdict delivered by Murray Moss, owner of the eponymous store and gallery space in Soho, at the beginning of last year. It seems that he was right. 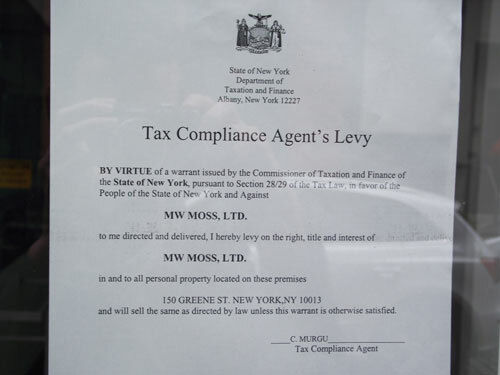 As of Friday morning, the store had been seized for nonpayment of taxes. For now, the arbiter of design retail in NYC and beyond is the property of the State of New York. A source working with the company to procure some pieces from its warehouse for an upcoming exhibition told AN that the facility had also been shut down. “Design tends to thrive in hard times,” says Mr. Cannell. No, it doesn’t. It tends to suffer, like any of the other humanistic disciplines. New ideas do not get championed or realized. Leadership turns to market-driven accommodation. Stay tuned: We will post the letter as soon as we receive it. As explained to us yesterday, mid-day, during an unexpected visit by officials from the NY State Tax Department, due to our failure to file a document (one of literally hundreds!) with the Department, an official, non-negotiable ‘procedure’ was triggered, whereby Moss was required to temporarily close. Our tax advisors, lawyers, and accountant have been great, working throughout the evening and morning to satisfy this State bureaucratic situation (which escalates 10-fold once the ‘procedure’ has been implemented); we believe we can get them all the documents they need within today, and re-open, if not tomorrow, then hopefully by Monday. We are of course embarrassed and a bit shaken (it’s not a fun moment when the State officials arrive…), but are at least grateful that the problem is in fact bureaucratic, and that we have resources in place, and that the problem can be remedied quickly (although at the State’s ‘pace’….). 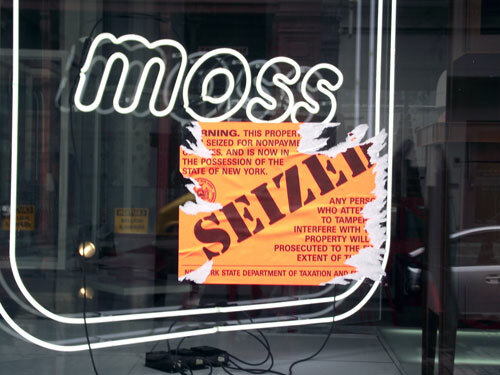 Because we’ve all been in dialogue, we know that many of you, like Moss, during the severe economic downturn of the past two years, in addition to possibly downsizing where logical, until growth is again possible, have entered into negotiations with various business partners, as well as the State, to arrive at mutually acceptable financial arrangements which make sense and allow for a stable, doable plan going forward. We have put financing in place, adjusted our overhead, and re-evaluated our projections, and are ready to go forward. This is to re-iterate to our friends: we are, in short, ok.
And in two weeks we will begin to install what we believe will be a fabulous Holiday offering. That’s it! Sorry for the inconvenience; thank you for your concern and love and support.